The north Atlantic is one of the most climatically unstable regions in the world. 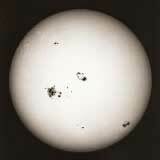 This is caused by a complex interaction between the atmosphere and the ocean. The main feature of this is the North Atlantic Oscillation (NOA), a seesaw of atmospheric pressure between a persistent high over the Azores and an equally persistent low over Iceland. 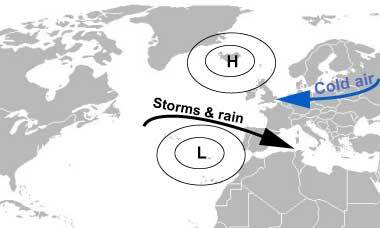 This is the "normal" pattern, called a positive NOA Index, and brings mild and humid air to northwest Europe. Sometimes the pressure cells are trading places and that has severe consequences for the weather in Europe. When the situation reverses, called a Negative NOA (high over Iceland and Low over Azores) the westerlies weaken or even reverse and cold air is streaming over Europe, causing a cold winter here. 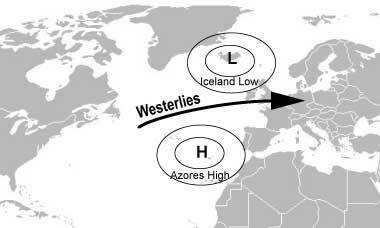 In negative NAO winters, it is much less stormy over the North Atlantic. Storms and low pressure systems bring humid air from the ocean into the Mediterranean region making it more unsettled in this regionn than normal. The small pressure difference allows northerly air to blow into Northern Europe making the winters dry and sunny but very cold here. There are strong indications that during the Little Ice Age the NOA was more often in a negative mode. Volcanic eruptions are another possible cause - for example, the year after the Tambora eruption (1815) was known as the "year without a summer." But, the effect of such eruptions might be limited to only a few years so this can not have been the cause for the prolonged climatic variations associated with the Little Ice Age. After 1870 the Little Ice Age made place for the slightly milder conditions of the 20th century. Scandinavia was also hard hit by the colder conditions of the Little Ice Age. Tax records show many farms were destroyed by advancing ice and by melt water streams. Travellers in Scotland reported permanent snow cover over the Cairgorms in Scotland at an altitude of about 1200 metres. In the Alps, the glaciers advanced and bulldozed over towns. Ice-dammed lakes burst periodically, destroying hundreds of buildings and killing many people. As late as 1930 the French Government commissioned a report to investigate the threat of the glaciers. They could not have foreseen that human induced global warming was to deal more effective with this problem than any committee ever could. Despite the difficulties in marginal regions, culture and economy were flowering in Europe. This is most visible in the way that people transformed their environment during the 17th and 18th centuries. 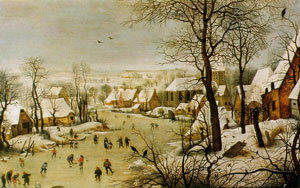 Winter landscape by Bruegel the Elder. The Little Ice Age coincided with the maritime expansion of Europe and the creation of seaborne trading and later colonial empires. First came the Spanish and Portuguese, followed by the Dutch, English and other European nations. Key to this success was the development of shipbuilding technology which was a response to both trading, strategic but also climatic pressures. Art and architecture also flourished, which is probably best embodied in the wonderful winter landscape paintings which can be considered a direct result of the Little Ice Age. These paintings show us skating people enjoying themselves, a sign that they were more than capable to withstand the hasher winter conditions and that they had also enough food. The latter is a key element in the success of European culture at that time. During the later Middle Ages, slowly but steadily farmers started to experiment with new agricultural methods, in order to adapt to increasingly unpredictable climates and also stimulated by the growth of profitable markets in growing cities and long distance trade. This initially low technology agricultural revolution started in Flanders and the Netherlands in the fifteenth and sixteenth centuries. Dutch farmers experimented with lay farming, the deliberate growing of animal fodder and cultivating grasslands for cattle. In addition they started systematic breeding of cows and the Frisian milk cow is probably the most famous example of this. Another innovation was the continuous growing of specialized crops. Instead of letting valuable ground lay fallow, they planted peas, beans and especially nitrogen-rich clover, all of which provided food for humans and animals alike. The vegetables were rotated with grain, turnips and later potato for export but also for feeding dairy cattle. As a result of this system the amount of fallow land contracted rapidly until non was existent. Agriculture became an intensive activity. The new intensive agriculture produced such a high surplus that Flanders and later the Netherlands could specialize and diversify their agricultural activity. With abundance of fodder, animal and dairy farming (think of Dutch cheese) became increasingly important. More meat, wool, and leather as well cheese cam on the market as the new agriculture broke the dependence on grain. At the same time farmers diversified into industrial crops such as flax, mustard and hops for brewing beer. This agricultural revolution could not have succeeded when new ships to withstand the harsher climatic conditions imported large amounts of grain form the Baltic, undermining local grain production. These grain imports made the Flemish and Dutch economy independent from climatic fluctuations causing famine.